"We want to create a comfortable and safe environment for our customers and staff and protect the building from any potential damage." 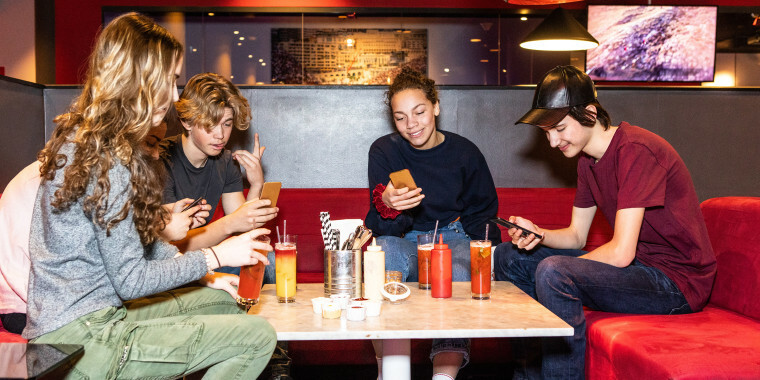 Many restaurants — and patrons — have taken discreet sides when it comes to debating how kids misbehaving while dining out should be handled. But a Wisconsin restaurant has decided to take a firm stand on who is allowed to eat inside by posting a sign on its door, banning middle schooler customers. A Fox Cities Restaurant is no longer allowing middle school students inside its premises after they say some kids have consistently misbehaved there. Tune into Local 5 News at 10 for the full story. Tom's Drive In, a Wisconsin-based restaurant chain with several locations throughout the state, has banned middle school-age students at its Appleton location, which is located at 701 E. Wisconsin Avenue. Manager Brandon Coumbe told TODAY Food that he posted the sign about eight months ago after middle schoolers who came in to dine at the restaurant became "so disruptive and destructive" that their behavior not only disturbed other customers but stressed out his staff. Coumbe explained that many of the students were yelling profanities, carving various designs and letters into tables, using Sharpies to mark up various place around the restaurant property, arguing with other customers who asked them to stop being loud and even standing on tables. The chaos, said Coumbe, became so bad and frequent that it was turning away regular customers, like families with young children, who often used to come into the restaurant after school. "We want to create a comfortable and safe environment for our customers and staff and protect the building from any potential damage," said Coumbe. Coumbe stressed that the intention of the ban is not to bash students (he even told TODAY that he employs high school students on staff), but rather to "teach them to respect the properties they go to," he said. The restaurant does have outdoor seating, and students of all ages are currently welcome to order at the walk-up window and dine outside, Coumbe said. They're also welcome inside if they are accompanied by their parents or an adult companion. An Instagram post from WFRV, a Wisconsin station, sharing a photo of the sign has garnered many comments in support of the restaurants decision. One person commented: "The business is the owner and managements livelihood. They are there to offer food, not babysit unaccompanied 11, 12, and 13 year olds. Kudo's to Tom's." While another agreed, saying: "Good for this restaurant! Let these kids go home and pull this crap in their own house. Their parents wouldn't stand for it. No one should have to put up with them." Coumbe said the restaurant's policy is currently in place through the end of the school year. Later this year, he will reevaluate it with other managers to discuss what should be done over the summer. Disruptive teens have reportedly not been an issue at any of the other Tom's Drive In locations, he said. However, Coumbe noted that his restaurant happens to be located in the center of several area middle schools. This isn't the first time a restaurant has banned unruly middle schoolers. According to WCIA, a Subway and Dunkin' in central Illinois both banned large groups of students from coming into their restaurants after the kids were caught repeatedly throwing food, walking on tables and yelling profanities. Lyn Mettler is an Indianapolis-based travel and lifestyle writer, who shows others how to travel free or for less on her GotoTravelGal.com blog.